I recently lead a discussion on building and maintaining a LinkedIn audience on Paper.li’s #Bizheroes Chat. Q1. How do we start building an audience in LinkedIn? What are the first steps? The first thing you can do to start building a LinkedIn audience is to have a complete LinkedIn profile. People need to trust you before they will listen. Connect with people and build up your network. As people are more likely to read an article from someone with connections as opposed to someone with zero. Q2. What kind of content delights LinkedIn users? How is it different from a regular blog? Content that delights LinkedIn users are How to articles, articles on News and Industry Trends. It is important to have a great headline that will catch the reader’s attention along with content that supports it. LinkedIn is different from a blog in terms of SEO because users can only use three tags where as a blog user can use an unlimited amounts of tags. Also, the user owns their blog in terms of branding and content where LinkedIn owns the content on their platform. However, LinkedIn has over 400 million users and is the largest business publishing platform. Q3. Are there any rules we should follow when trying to attract an audience on LI? When trying to attract an audience, it is important to write with your audience in mind. What is your objective for writing and publishing content? What types of content do they find valuable? Also, curate content from people in your industry, influencers & non influencers. This will help to build a relationship where they will share your content if they think it is valuable. LinkedIn provides suggestions when you share a post. It is a good idea to check the channels for your industry as LinkedIn has many specialized channels for content. Q4. How do we make sure we’re attracting the right audience? See who is sharing/engaging with your content. Is your target audience sharing it? Examine content that gets shared in your industry. Q5. How can you use LinkedIn to market yourself or your business? Users can create business pages, groups and most importantly keep creating and sharing content/relevant insights. Remember the audience determines what is relevant. Q6 Is there a way to share your own work without being too self-promotional? Use SlideShare for content repurposing as it is great to embed in posts, use videos along with text, pictures etc… This will allow you to put a different spin on your work; changing things up with your audience. In my posts, I share links to relevant articles I wrote on the topic. At the bottom of each post, I create an about the author section. This gives the reader a choice if they want to learn more and does not compromise the quality of my work. Q7 How can we try and build relationships and then take them off of LinkedIn? Users can use LinkedIn groups and messages to share relevant insights, conferences and networking events with connections. How have you built and maintained an audience on LinkedIn? Inbound Marketing is a valuable strategy businesses can use to obtain new customers. Inbound Marketing is defined as Marketing based on getting found by customers. It’s customer-centric. With Inbound Marketing, businesses create customer-centric content based on customers needs. Content could take the form of blogs, videos & SEO. In a prior article, I outline the 4 Steps which are Attract, Concert, Close and Delight. Recently, I read an article that advocated that Inbound Marketing should take a backseat to your current customers. While it is less expensive to keep, nurture and up-sell/cross-sell current customers, businesses need to always be on the hunt for new customers. Despite the fact that it costs 5 times the amount to acquire a new customer verses keeping an existing one, it is an expense that businesses need to take on. This is because businesses will always lose a portion of their customer base for a variety of reasons as seen in this graph. According to Marketing at Work, the average business loses about 10 to 25 percent of its customer base every year. What happens if businesses start Ignoring customer acquisition? Through great service, word of mouth, & customer referrals; businesses may be able to extend their life. This then becomes an issue of how fast they can replace the lost customers. Relying on these methods alone puts undo pressure on customers and they may get turned off by being constantly asked to refer people. This may result in more customer turnover. As we have seen, focusing only on customer acquisition and customer retention is a losing game. Supply customers with exclusive access to blog content with useful tips and tricks for customers to get the most out their purchase. Make customers feel like insiders. Groups can be created on Social Networks such as Facebook, LinkedIn and specialized forums on a company site. Use these groups to share content and invitations to customer only events. These sites can be shared with both current customers and prospects. Adobe does a great job with their CMO.com site which provides content and insights to CMO’s and marketing professions. How have you used Inbound Marketing for customer retention? Share and comment. He writes and publish a business blog on the topics of Sales, Marketing & Social Media entitled Sales, Marketing & Social Media Today. Recently, I became certified by Hubspot in Inbound Methodology. For Inbound Marketing to be successful, businesses must understand their target market; analyzing their ideal customer. To analyze this ideal customer, businesses need to do research to understand the life of their consumer. What are these customers habits, concerns, needs and challenges? In other words create a buyer persona. The four principles of Inbound Marketing are: 1. Attract, 2.Convert, 3.Close & 4. Delight. The first things that any business wants to do is to attract customers. One way to attract customers is to have a website. In order to make sure that customers find this website, it must be optimized in relation to how customers find a business. To do this, a site must have relevant keywords, along with meta tags or page descriptions to index in search engines. Google & Hubspot have Keyword tools. Blogs are a great way to serve customers who are searching for information on a product or service. Each time blogs are published, they creates a new page to be indexed by search engines, which helps with SEO rankings. Customers who are interested in a site’s content will help to drive traffic to that site and may even link to it. Sharing blog content to social media channels can help to drive traffic to a website. Popular sites are LinkedIn, Twitter, Facebook etc… I have received a lot of traffic to my own websites by sharing my content on my social media channels. According to Hubspot, 80% of marketers & 60 % of sales professionals have found qualified leads on social media. Once a prospect lands on a site, the goal is to convert them into a lead. To be able to to convert them into a lead, it is important to have a call to action such as: click here to get this ebook free. Once the prospect clicks on the the call to action button, they will be directed to a landing page where they will get more information on the ebook. At this point prospects will be asked to enter their name and email address. Once this occurs, they will be directed to a thank you page. A Call to Action is a button that promotes an offer and links to a landing page. A Call to Action needs to be clear and action oriented. In other words, it needs to tell visitors what to do. Instead of stating click here, say download this ebook. Get articles on Sales, Marketing & Social Media delivered to your inbox for free. Join 9,178 other followers and enter your email address. A Landing page is where the visitor ends up after clicking a call to action button. Landing pages serve as a digital sales rep and are designed to collect visitor information; converting them into a lead. When & if someone wants to change the layout of a landing page, it is important to change one element at a time to see what is working & what is not. A thank you page is where visitors converted to leads land after they fill out their information on a landing page. This is the page that ends the conversion process. A thank you page is great place to provide visitors with more information about relevant products and services and thanking them. It does two jobs in one which brings the lead closer to being a customer. Thank you pages should tell visitors what they should expect next such as: Thank you for signing up we’ll call you in 2-3 business days. 1. Email is a channel that is owned by its users where social networks are not. It is important to know the buyer journey which includes the stages of: Awareness, Consideration & Decision. This important because it helps marketers send the right message to customers in respect to their stage in the buyer journey. Content that would fit into the awareness stage would be videos, blogs, slideshares & free tools. Buyers in the consideration stage would benefit from: Webinars, Case Studies, FAQ Sheets, Product whitepapers & Third Party reviews. For the decision stage, offer: free trials, ROI reports, product demos, consultations, estimates & quotes. Great emails contain the following, a personal reason for sending the email, image as CTA, encouragement to download & share with friends & colleagues, actionable language and personalized CTA signature. Smarketing is the process of aligning sales & marketing teams around common goals with in a business or organization, focused on improving revenue. Both teams must be aligned to the same goals for Smarketing to be effective. This makes both the sales and marketing more effective. A Lead is defined as anyone who submitted contact information in exchange for an offering. Marketing Qualified Leads or MQLs indicate that prospects are engaged with a product or service and want to learn more about it. They are ready for the sales team to follow up. Sales Qualified leads are described as leads that both marketing & sales feel are worthy of follow up. Opportunity is a customer that a Sales rep has communicated with & logged in CRM as a legitimate customer. Inbound Sales is the transformation of the sales process. Traditional Selling was Seller centric. It was based on cold calling, controlling information and a sales pitch. Inbound Sales attracts potential customers because sales reps share compelling content, freely share information with customers and use the buyers situation to help them make the right purchasing decision. In today’s connected world. buyers have access to information at their finger tips. According to Hubspot, 60% of a buyer’s purchasing decision has been made before speaking to a sales rep. Businesses spend most of their money on attracting new customers when in many cases it is cheaper to keep existing customers. There are three pillars of delight which include: innovation, communication & education. 1. Innovation-is to change the status quo and provide customers with the right solutions. 2. Communication- it is better to be personal with prospects & customers offering customers help. 3. Education-it is better to empower people than to ignore them. Businesses need to educate their customers about what is the best way to solve their needs. The three pillars of delight are what makes up a great sales rep or business. Everyone needs to help customers because they form impressions of your business with each interaction. 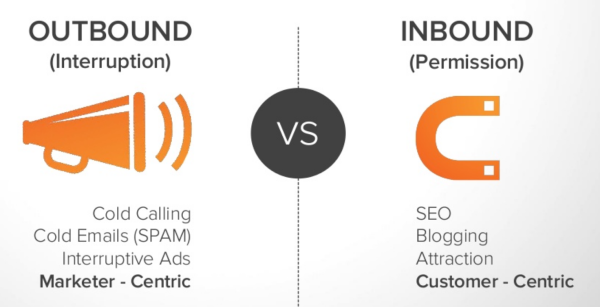 This is the inbound marketing methodology by Hubspot in a nutshell. To learn more go to the Hubspot Academy site and earn your certification. How do you use Inbound marketing in your business? Comment below & feel free to share.